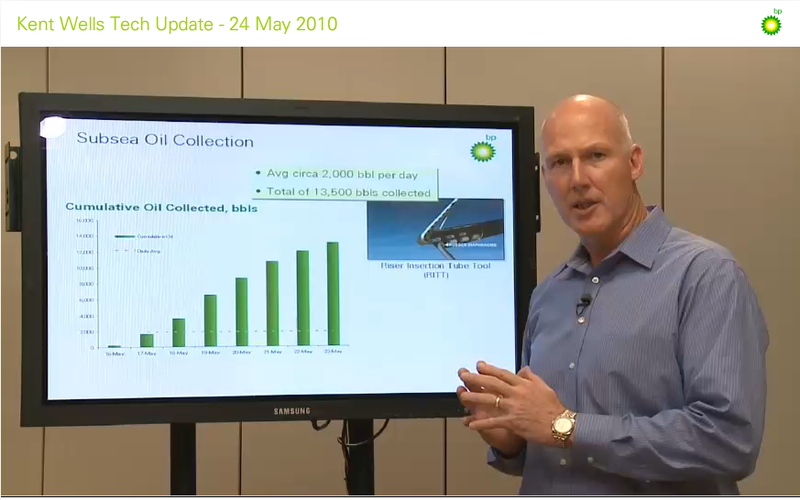 Kent Wells, BP's Senior Vice President of Exploration and Production, has a "technical briefing" video up. Its aim is to give the public a little more detail about their efforts to stop the leak. After explaining what all their different ships and robots are doing, he gets into their containment efforts and talks about how they're collecting oil directly from the leak with their "riser insertion tool." He uses this chart (bigger version here) to illustrate the amount they've been collecting. In case you can't read the chart, it has time on the x-axis and the volume of oil collected on the y-axis. Wells explains (at around 4:10) that since they got the riser insertion tool in there, they've been tweaking a few different variables to maximize the amount of oil it collects and points to the chart, saying that it illustrates how they've been "ramping up." Here's the problem (first caught by Rachel Maddow's blog): The volume of oil represented by those green bars is cumulative. It's the running total amount of oil the riser insertion tool has collected, not each day's individual total. So of course it's increasing. It couldn't possibly decrease. In the context of the video, however, you might well think that these ever-taller green bars represent an ever-more effective oil collection thanks to the parameter tweaking he's just been talking about. As you can see, the daily totals have not been steadily increasing. They've been bouncing around a bit. He's not lying, really. The chart is correctly labeled. But given that he talks about "ramping up" the collection thanks to tuning the riser insertion tool just right, and avoids mentioning the fact that the totals are cumulative, and avoids showing the chart full screen, it is misleading, and seems deliberately so. And this brings me to a larger point that's been on my mind. We're reliant on BP for information about this crisis. They know where their ships are and what they're doing. They know what's going on on the sea floor because they're the ones with the crazy equipment to get down there. Some of their information has been good (their useful infographics have been reposted by Cliff Kuang over at Fast Company). But we should remember that Congress had to force them to provide the live feed of the leak, their estimates about the volume of the spill were way off, and even in a video like Wells's they're trying to obscure embarrassing details. These days we expect a constant flow of information about a developing disaster like this one, but it's problematic when the culprit is controlling the well.